Winter heating obviously keeps your home warm, but it also robs the air of much-needed moisture. For some people, this parched air is difficult - even painful - to breathe. Dry heat can also cause cracks in furniture and woodwork. 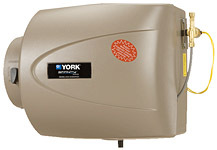 With York's complete line of Steam, Power and Bypass Humidifiers, your York Dealer can find the right model to put humidity back in your home, moisturizing the warm air and making your family more comfortable. Air quality is only a concern outdoors, isn't it? Not true! The air inside your home can be even more of a concern to your health and comfort, especially in the winter. When cold, dry air enters your home and is warmed to room temperature, the relative humidity in the average house can drop to as little as 5 percent. Compare that to the average 25 percent relative humidity of the Sahara Desert and you can understand why the air inside your home can seriously affect your health and comfort. Since various studies have estimated that most people spend as much as 90 percent of their time at home indoors, there's reason to be concerned about indoor air quality. Since the air in your home is always trying to reach its saturation point, it will absorb water wherever it's found. That means it is stealing moisture from the bodies of you and your children, your pets, your furniture and even your houseplants. By giving up moisture to the air, your skin, throat and nasal passages dry out and crack, leading to various physical discomforts. That's why many doctors recommend humidifiers for allergy and asthma sufferers. Research has shown that 30 percent to 60 percent relative humidity is ideal. 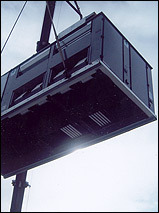 Outside this range, bacteria, fungi, viruses and mites thrive and multiply. As these creatures increase in number, so does your risk of being adversely affected. Are there any other BENEFITS to properly conditioned air? 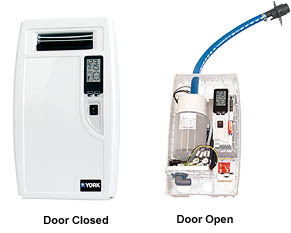 A portion of the heated air from the furnace passes through a water-soaked pad where it absorbs additional moisture and then returns for distribution throughout your home. Water is metered across the patented KineticFlo trough. Unevaporated water drains from the bottom of the unit to eliminate mineral buildup. 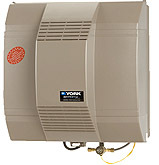 A portion of the heated air from the furnace passes through a watersoaked pad where it absorbs additional moisture and then returns for distribution throughout your home.